Small wooden box intricately carved and painted with a lovely white finish. measures 2 by 2 inches. MATR BOOMIE is a fair trade collection from India that marries modern design sensibility with inspiring traditional art forms, bringing people and cultures closer together. With the mission of creating opportunities for women and minorities to realize their creative, economic and leadership potential. 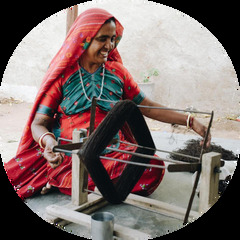 They have grown to empower 20,000 artisans in 40 partner communities throughout India.